New England Treatment Access opened in Brookline on Saturday as the first marijuana shop in Greater Boston. Employees (left) waited on customers at the counter. BROOKLINE — Greater Boston’s first recreational marijuana shop opened in Brookline Village Saturday with all the expected fanfare but none of the traffic disasters town officials had feared. Officials spent months preparing for hundreds — and even thousands — of customers to line up at New England Treatment Access, bringing the potential for clogged sidewalks, packed intersections, and few open parking spots. Whether those issues will arise during the workweek has yet to be seen, but on Saturday morning, everything was orderly, even as hundreds raced to the store on its opening day. 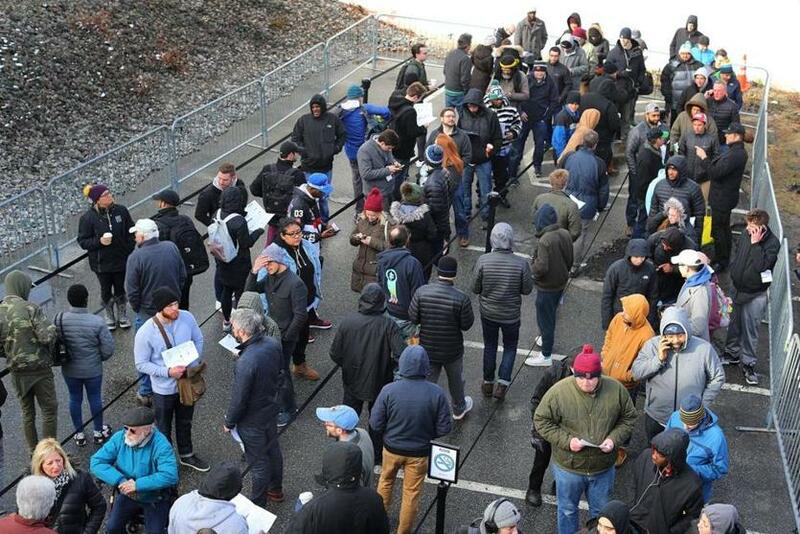 NETA leaders reported they made sales to about 2,500 people by the time the store closed at 10 p.m.
“The predictions of an apocalypse are not coming true,” said Brookline Selectman Neil Wishinsky, who made the first purchase of marijuana products at NETA on Saturday. NETA’s Brookline store, which received a final license Thursday to open a recreational marijuana shop, has been a medical dispensary since 2016. 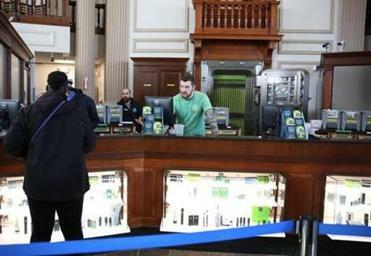 NETA officially opened for recreational marijuana sales, at the corner of Washington and Boylston streets, at 9 a.m. Saturday, becoming the state’s 13th adult-use store and launching Greater Boston into a new era of marijuana legalization. NETA’s other location, in Northampton, was one of the first two stores to open on the East Coast when sales began in November. 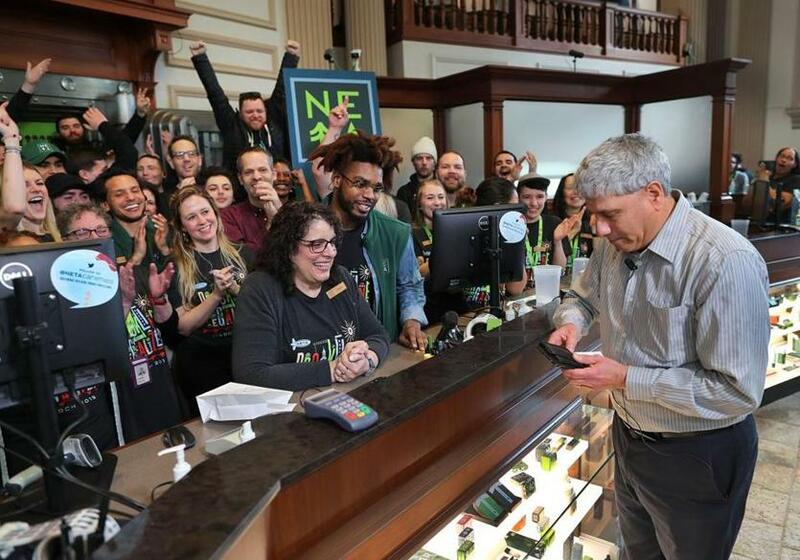 NETA’s employees counted down to 9 a.m., cheering and applauding as Wishinsky made the first purchase — nuggets and lumens, both forms of edibles. “And I guess at some point I’ll find out what that means,” Wishinsky joked outside NETA after his purchase. By the time sales began, at least 100 people had gathered outside, lined up in NETA’s parking lot, which is temporarily closed for at least the first week of recreational sales. NETA employees were handing out food and drinks to those in line, including coffee and mini-muffins. Though most customers arrived close to the store’s opening, some came long before sunrise, eager to be among the first inside. James Jenner drove from Salem and arrived around 5 a.m., waiting in his car as long as he could. About 6:15 a.m., he saw a man walking down the street carrying a folding chair. If Jenner wanted to be first, it was time to bundle up. And bundle up he did, first in his coat and Patriots winter hat, then with a gray NETA blanket given out to the first few customers in line. A jubilant James Jenner, 38 from Salem was the first person in line as he held up what he bought. 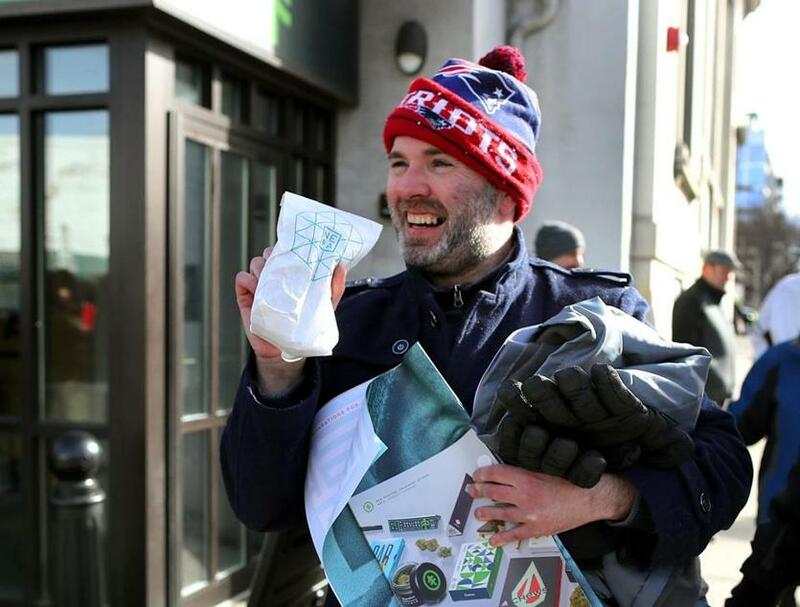 Greg Berkel, who lives in Dorchester, got to Brookline around 8:30 a.m., easily found parking at a metered spot, and stood in line for about an hour. He said he just really wanted to be in the first wave of customers. “It was day one. I wanted to be one of those people,” said Berkel, 45. Throughout the morning, customers in the full-service line said they waited outside for about 45 minutes to an hour. Instead of waiting in that line, the majority of customers utilized NETA’s Reserve Ahead program on the company’s website, which allows people to peruse the products and place orders ahead of time. A separate, expedited line was available for Reserve Ahead customers, and on Saturday morning, customers rarely waited more than a few minutes in that expedited line. Medical patients have a designated parking lot across the street and do not have to wait in line with the adult-use customers. Ahead of its opening, NETA had strongly encouraged people to take public transportation, given the limited parking in the area. Though many customers heeded that advice, the ones who drove also said they had no trouble finding parking spots. Amanda Rositano, NETA’s director of operational compliance, said Saturday that she enjoyed seeing the customers move through the line quickly and happily, and that the store’s opening day was going exactly as planned. Customers seemed pleasantly surprised Saturday morning by the speed of the line and the options available inside. And despite the cold, brisk winds, many people waiting Saturday took the opportunity to make new friends. Evan Smith, 30, spent his time in line chatting with a woman who he joked was his new “best friend.” Smith lives near NETA and walked to the store. “Having a location like this, especially in Brookline, too, which is really, really unexpected, I think it’s really cool,” he said. Connor Cirillo, 23, also said he made friends in line Saturday and he enjoyed seeing the diverse group of people that had come to shop at NETA. Brookline selectman Neil Wishinsky was the ceremonial first customer as employees cheered behind Laura Ross, who waited on him. The line outside the store Saturday morning.